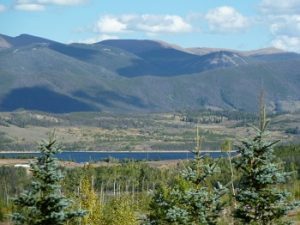 Cortina Sub in Silverthorne Resal Estate is comprised of mainly single family homes featuring spectacular lake and mountain views. Located in the Wildernest area of Silverthorne Colorado at the base of Buffalo Mountain, Cortina Sub is comprised of 117 lots located just beyond Mesa Cortina Sub. As of 2013 there are 15 vacant parcels and 102 exisiting homes. The Silverthorne homes located in Cortina Sub were built between 1968 – 2008 set up on 0.31 – 1.45 acres with 1 – 6 bedrooms and 1,296 – 4,054 square feet. Many of these mountain homes boast impressive views of Buffalo Mountain, Lake Dillon, the Keystone Ski Resort, Peaks 1 and 2 of the Ten Mile Range and views toward Silverthorne/downvalley. Set adjacent to the White River National Forest, Cortina Sub is steps from many hiking trails and is a great area to view wildlife. The Silverthorne homes and vacant parcels of land in Cortina Sub can be found off Royal Buffalo Drive on Elk Thistle Drive, Larkspur Lane, Shooting Star Way, Sky Pilot Lane, Spring Beauty Drive and Thimbleberry Way. If you are looking for a home in Silverthorne Colorado with beautiful views and hiking out your back door, take a look at the homes for sale in Cortina Sub in Summit County Real Estate.